The EMS 7620 is a compact entry-level SEM sputter coater. When combined with the optional EMS 7620-CF carbon fiber evaporation attachment, it makes the ideal low-cost SEM sputtering and carbon coating system package. 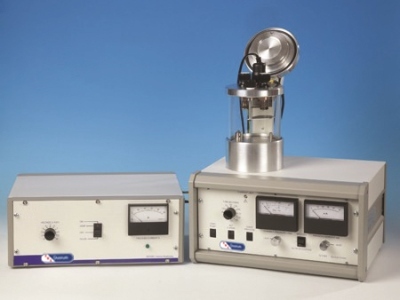 Additionally, the EMS 7620 is fitted as standard with a glow discharge function, making it suitable for the hydrophilization (or 'wetting') of carbon-coated TEM grids and for other surface modifications. Note: For a fully automated glow discharge solution, see the GloQube, EMS-Glo-2. The EMS 7620 is primarily designed for coating specimens prior to examination in tungsten filament SEMs. For extra fine grain coating required for most FE-SEM applications, high vacuum coating is required – see the EMS 150T Plus or EMS 300T T Plus. For a fully automatic coater for W-SEM applications, see the EMS 150R Plus. The EMS 7620 is ideal for the budget-conscious user who demands quality thin film deposition from an easy-to-use instrument. 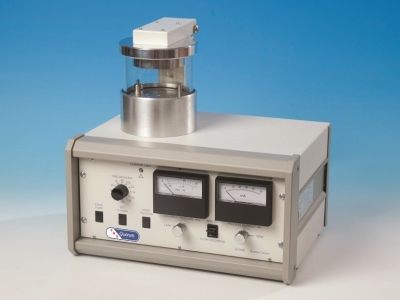 Designed for routine applications, the EMS 7620 uses a basic magnetron sputter head with a simple-to-replace disc target (gold/palladium as standard). The sputtering head is hinged for easy operation and fitted with electrical safety interlocks. 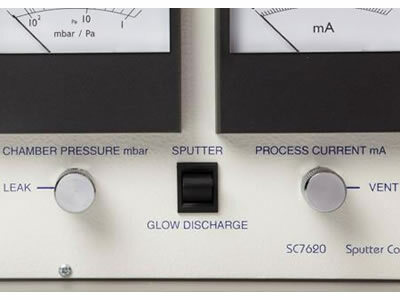 A panel-mounted switch allows the system to be changed between sputter coating and glow discharge modes. To prevent accidental damage, the high voltage lead is shielded. The plasma current is variable by adjustment of the vacuum level using an argon leak valve with the plasma voltage being preset. For maximum sputter coating efficiency, the gas injector system ensures that argon gas enters the chamber close to the plasma discharge. Venting is to argon. A suitable rotary vacuum pump is required. The Pfeiffer DUO 6 5m3/hr two-stage rotary vacuum pump (91003) is ideal for this purpose. See Ordering Information for more details. 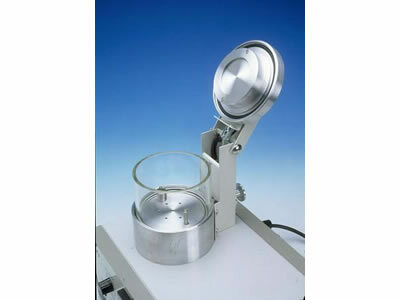 The 100 mm/4" diameter Pyrex cylinder is mounted on an aluminium collar and sealed with O-rings. The small vacuum chamber size means pump down times and cycle times are fast, and also allow a small economical rotary pump to be used. The specimen stage is height-adjustable and can easily be removed to accommodate taller specimens. The deposition rate is controlled manually by a 180-second timer with 15-second resolution. 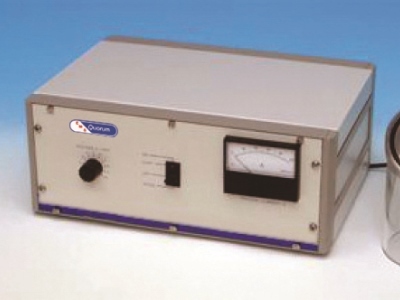 Pressure and plasma current are monitored by analogue meters. The EMS 7620 will deposit coatings suitable for use with tungsten-filament SEMs and has the advantage of simple operation, ensuring reliability and suitability for general use. It can quickly be converted to deposit carbon by the addition of an optional carbon evaporation attachment, consisting of a switchable voltage power supply and a carbon fiber head (see EMS 7620-CF below). The carbon attachment comes with an additional glass cylinder. This is taller than the standard sputter coater cylinder and ensures that the distance between the carbon fiber and the specimens is optimal for the evaporation process. A three-way switch on the front panel allows the EMS 7620 to be switched to glow discharge mode. Freshly-made transmission electron microscopy (TEM) carbon support films tend to have a hydrophobic surface that hinders the collection of TEM sections from the surface of water baths and prevents the spreading of suspensions of particles in negative staining solutions. However, after glow discharge treatment with air, carbon film can be made hydrophilic and negatively-charged, thus allowing collection of TEM sections and easy spreading of aqueous suspensions. A 5m3/hr Pfeiffer DUO 6 two-stage rotary vacuum pump (91003) is recommended. A carbon coating accessory (EMS 7620-CF), which consists of an evaporation power supply and carbon fiber head, is available. Fitting the optional carbon evaporation attachment is simple – the sputtering head is tilted back on its hinge and replaced with the carbon fiber head. Connection is then made to the power supply. To ensure that the exposed sputtering head cannot be powered when the add-on carbon head is under vacuum, a positive-break mechanical interlock ensures electrical isolation of the sputtering head. For a 'stand alone' SEM carbon coater, see the EMS 150R E Plus. Gold/Palladium (Au/Pd): Supplied as standard and has the same properties (sputtering rate, secondary electron yield, etc.) as gold, but the sputtered grain size is smaller. Gold (Au): Gold sputter coating is still widely used in many laboratories. Silver (Ag): Compared to the other metals, it is relatively easy to remove silver and it is therefore useful for museum, forensic and similar specimens. Palladium (Pd): Sometimes used instead of gold and gold/palladium for x-ray microanalysis. A suitable main electricity supply (110 VAC – 20 A or 240 VAC – 13 A, frequency 50/60 Hz) is required. Check that the voltage label attached to the side of the cabinet is suitable for the local voltage and frequency supplied for either 230 V or 110 V operation at 50/60 Hz. The power rating is 250 VA excluding the rotary pump. The rotary pump outlet is rated at 230 V at 10 A or 110 V at 16 A. The 240 V pump outlet uses either a three-pin plug or 110 V standard US plug – both supplied. Carbon evaporation attachment (option). The EMS 7620-CF carbon fiber evaporation accessory are supplied for either 230 V or 110 V operation at 50/60 Hz. A suitable main electricity supply (110 VAC – 20 A or 240 VAC – 13 A, frequency 50/60 Hz) is required. Check that the voltage label attached to the side of the cabinet is suitable for the local voltage and frequency. Sputtering Gas Argon gas (Zero Grade: 99.999%) fitted with a two-stage regulator in order to deliver gas at a pressure of around 5-10 psi (0.5 bar). 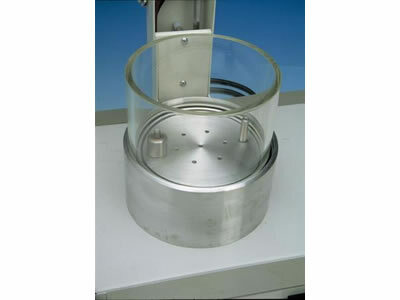 Space requirement 340 mm W x 320 mm D x 310 mm H (including chamber and sputtering head). Weight: 14 kg. Additional space is required for the rotary pump which can be located either on the floor or on the bench with the coater. A 50L/m two-stage rotary pump with oil mist filter is recommended If intending to use an existing rotary pump it is important that its capacity is 50L/m or greater. A carbon coating accessory (EMS 7620-CF), which consists of an evaporation power supply and carbon fiber head, is available. Fitting the optional carbon evaporation attachment is simple. The normal sputtering head is tilted back and replaced with the carbon fiber head. Connection is then made to the power supply. To ensure that the exposed sputtering head cannot be powered when the add-on carbon head is under vacuum, a positive-break mechanical interlock ensures electrical isolation of the sputtering head. We also offer a 'stand alone' SEM carbon coater, see the EMS 150R Plus. Gold/Palladium (Au/Pd): Supplied as standard. Has the same properties (sputtering rate, secondary electron yield, cost) as gold but the sputtered grain size is smaller. Platinum (Pt):The sputtered grain size is smaller than gold or gold/palladium. Platinum has a slower sputtering rate and is more expensive than gold or gold/palladium. Silver (Ag): Compared to the other metals, it is relatively easy to remove silver. Therefore it is useful for museum and forensic specimens. Palladium (Pd): Sometimes used instead of gold, gold/palladium and platinum for x-ray microanalysis. EMS strives to maintain accurate pricing. However, due to fluctuations in precious metal prices, pricing on products containing precious metals is not guaranteed. We will contact you if there is a discrepancy. The 7620-CF carbon attachments are modular add-ons for our sputter coaters, allowing carbon fiber or carbon rod evaporation. Each attachment uses the existing chamber and vacuum system of the sputter coater and is therefore a costeffective and efficient method for the evaporation of carbon for SEM applications. Note that the diameter of the top plate will vary according to the chamber size of the sputter coater onto which it is being fitted. We also offer free-standing carbon evaporators – see the EMS 150R Plus and EMS 150T Plus. The EMS 7640-CF, EMS 7640-CR and EMS 7620-CF can be used in conjunction with the EMS 7620 (EMS 7620-CF), EMS 500X, EMS 550X, EMS 575X, EMS 650X and EMS 675X sputter coaters. Sometimes it is also possible to retrofit one of the above onto our older models, Please contact us for information on compatibility. 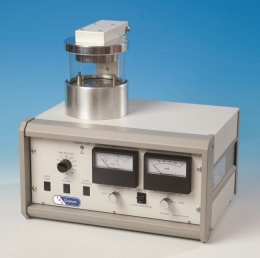 The attachment consists of two components – a free-standing power supply and a carbon fiber or carbon rod head to suit the chamber size of the sputter coater onto which it is to be fitted. The power supply is switchable between 10V/100A (for carbon rod evaporation) and 20V/50A (for carbon fiber evaporation). A vacuum interlock is provided to ensure safe operation of the sputter coater and carbon accessory system. Out-gas and coat switches are provided for complete control of the evaporation sequence. NOTE: 3.05 mm diameter carbon rods are used with the EMS 950X, EMS 450X and EMS 350. 6.15 mm diameter carbon rods are used with the K975X and with most older Polaron-branded carbon evaporators.